As Eric says, a bit of helmet hair is not a bad thing, but it’s not a look that everyone wants. There are also the times the helmet hair look just doesn’t go with your outfit or the occasion. Okay looking hair is a challenge, even in this forgiving business casual environment. Here’s five ways to look your best. Number 1 – get a good cut. This is where a top stylist can help. 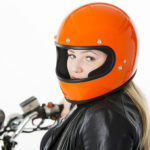 Tell them you are planning to wear a helmet on a regular basis. Ask them for tricks to “fix” it on the fly and ask them to show you how to style your cut. Then, adjust your riding schedule. i.e. Take your hair product to work. Don’t use it before you leave. The time you save getting ready can be added to arriving a bit early to work. Ladies – ask if your current cut works into a “beachy look”, when needed, as a styling option for your hair. No surprise for number 2 – wear a hat. Good news. This could also cover up a bad cut. While a perhaps a self-evident suggestion, there are risks doing this. The hat could look worse than your helmet hair or a hat may not suit the occasion. Still, for a casual ride with your buddies, it’s hard to beat. Number 2a – put sunglasses on your head. This is a measured tactic, especially if it’s sunny out and you are the dork who has sunglasses on their head and not on their eyes. In a pinch, and you forgot your hat, they add some volume to your hairline and distract from your lifeless hair. Number 3 is for those with long hair – wear a scarf. Think of the 50s’ woman riding in a convertible. That signature cure head–scarf was to keep their curls from flying about. Wrap the whole scarf over your hair under your helmet or fold the scarf into a cute 50s’ inspired headband. Guys reference: Keith Richards, Aston Irwin, or Rafael Nadal. You get the idea. Number 4 – “energize and comb”. Guys can be a little reluctant to do this, but with practice, it can be a quick dance. And you get used to working with the mirrors on your motorcycle. Follow the instructions from your styling professional. Generally, a short finger scrub of your hair helps break it up. Then with your lightweight brush (more so than a comb) you can casually style it back in place. It won’t be perfect, but it usually won’t be as flat. If you have some water handy, you can add that to the finger scrub to break for some extra temporary hold. Number 5 – Dry Shampoo. Many stylists call this the miracle worker. Again, follow the instructions from your styling professional. They can set you up with the brand of dry shampoo that works best for you. Some guys like scent free. A quick spritz and a finger scrub and off you go with hair that has some life back into it. You can generally repeat the process over many stops on a longer trip too. The popular look is not to comb it. Just use your fingers to shape it into place. The down side is you are carrying around a can of product, but isn’t looking fabulous worth the extra effort? That wind tousled post-ride bike hair can easily be worked into runway ready hair! There are a couple honourable mentions. One is to cut your hair so short as to mitigate the helmet hair issue all together. Great, if that’s the general look you like when you aren’t wearing a helmet. Remember, in big hair cases, it can also affect how your helmet fits.The other is to just own your helmet hair. It can be a conversation starter. As Eric says, he likes the after ride glow and helmet hair look. Take this road at your own peril. Next time: Helmet liners – how not to look like a dork wearing one.